From the winding bed of Italy's Carrione River comes the coveted Carrara marble. Crafted by hand and balancing timeless beauty with clean contemporary style, this Carrara-inspired look takes new form in Amerock's Carrione™ collection. 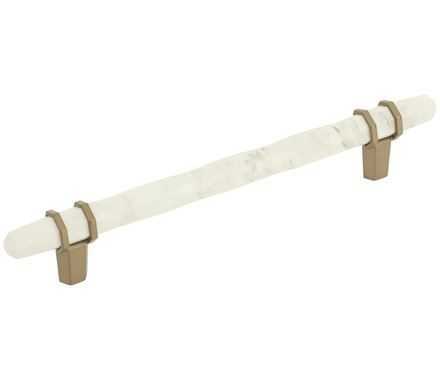 The Amerock BP36650MWBBZ Carrione 6-5/16in(160mm) Center-to-Center Pull is finished in Marble White/Golden Champagne.